Roaming Stamper: It's been a long time.. 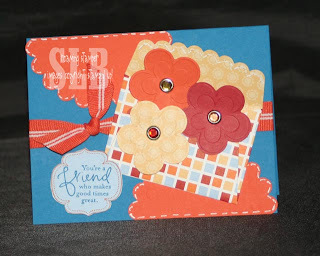 It's Friday and that means it's time for another Stampin' Addict's Color Challenge. This catalog year is winding down and it's time for me to start using up my In Colors! I have to say that I'm really going to miss this year's In Colors. There were a few I didn't love right away but I can honestly say this batch I probably used every color way more than I've done in previous years. Today's color challenge is: Tangerine Tango, Riding Hood Red, So Saffron, Pacific Point a nd Bashful Blue. I know it's a lot of colors but honestly, they look really good together!! As always, all products available from Stampin' Up! If you play along, please upload your design to the Stampin' Addicts website (button on right hand side) and put SACC11 in the keywords so I can find it!! I'm pleased to say that I am done with my huge stampin' deadline and hope to be posting more frequently but I start a two week substitute job today so we'll see!! What a great color combo! Fun card.